This is a photograph from my personal collection. I acquired it because I thought Heinrich looked like he was a really nice guy and because I thought I detected a glint of homesickness in his eyes. 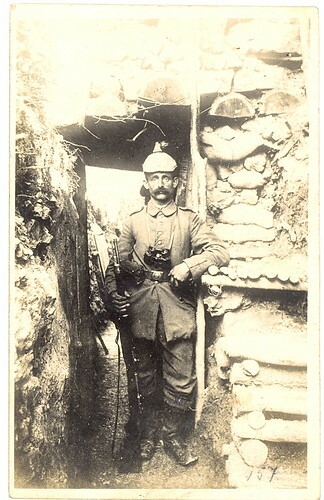 In spite of the less-than-ideal conditions that he is obviously living under in the trenches, he is striking a dignified military pose. Heinrich is wearing the classic German Pickelhaube spiked helmet. Before the war, the Picklehaube was supposed to be made from boiled leather, but as supplies of leather dried up due to the Allied blockade, felt, thin metal, and even compressed cardboard were tried as substitutes. We can't tell what his helmet is made out of because it is has a drab cloth cover to prevent light from glinting off the helmet plate and thus to reduce the chances of drawing the attention of snipers. At first these covers had red regimental numbers on the front, but as the color red also drew attention, this practice was done away with and the covers became plain, like Heinrich's. Another disadvantage of the Pickelhaube was the spike. It served no real purpose and was the first part of a German soldier to become visible if he peered over the parapet. Frontline soldiers often dispensed with spike altogether. As a result, the M1915 Picklhaube featured a detachable spike. Eventually, since a Pickelhaube made of thin metal, felt, or carboard provided no protection against bullets and shell fragments, it was replaced in the field by the heavy steel M1916 Stahlhelm "coal scuttle" helmet. However, the Pickelhaube continued to be used as part of the German dress uniform. Heinrich is wearing the black-and-white ribbon of the 2nd Class Iron Cross medal worn through a button hole and then tucked inside his tunic. For "barracks wear," usually only the ribbon was worn in this manner, and not the medal itself. The 1st and 2nd Classes of Iron Cross were awarded without regard for nationality or social class to combatants for acts of heroism, bravery, or leadership skills in wartime. His belt plate is the well-known German one with the silver-colored alloy central cartouche featuring a crown encircled by the motto "GOTT MITT UNS." It looks like the metal behind the cartouche has either been darkened or painted, as was the custom for battlefield wear. Heinrich's boots are the M1866 leather marching boots. Suspended from Heinrich's neck is a very interesting set of binoculars. I haven't been able to determine what model they are as of yet. I believe the large pouch suspended from the belt is a case for the binoculars. However, it is possible that it is a case for cartridges. In 1914 many German infantry regiments were armed with the 1898-pattern Mauser rifle - the Gewehr 98. I think perhaps that this is the type of rifle that Heinrich carries, but I am no expert. The Gewehr 98 held five rounds in an internal box magazine. The German Army issued carbines (the Mauser Karabiner 98a) to all other branches - cavalry, artillery, pioneers, independent machine gun companies, and motor transport units. This carbine was soon adopted by the Stormtoopers, and it slowly became the standard armament of Stormtroop formations throughout the German armies in the west. It was significantly shorter, and thus handier in the confines of the trenches. However, at prevailing combat ranges, it was no less accurate or hard-hitting than the Gewehr 98. Notice the neatness in the construction workmanship of the trench in which Heinrich is standing. Even the Allies acknowledged that the German trenches were superior in design and construction to theirs. From a defensive standpoint on the ground, this was a distinct advantage. There was a major drawback, however. From the air, the crisp, clean outlines of the German trenches were highly visible to the Allied flyers who strafed and bombed them with deadly accuracy.